This is a traditional mughal recipe that I got to taste when I attended a wedding engagement 5 years back. My colleague who happens to be a Muslim was getting engaged that evening and we all friends were invited. Both I and one of my friends along with our dear hubbies went to attend the function. The function went well and for the feast they had arranged a buffet dinner and so many food items were arrayed and I could smell the flavors of all the food teasing my nostrils. Both my hubby and my friend’s headed to the non veg section and my friend and I to the vegetarian. It is during these occasions that you get to view and also sample so many food items under one roof. One platter marked with Shaahi Paneer got my full attention. Those soft paneer chunks swimming around in the rich gravy was quite an eye sight. People who have been visiting my blog will be aware of my love for paneer and you bet that I did not miss out on this great opportunity. 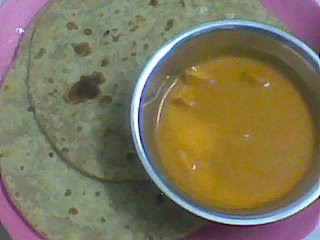 When I tasted this along it with rotis the taste was superb. I knew that I must know how to make it. The next day itself I rang her up and asked whether she had any idea of how to make the dish. Her mother is an expert in Mughal cuisine as she conducts cookery classes. So she asked her mother and gave this wonderful recipe and ever since then it has been one of my favorites. This is one of the simplest dishes which taste absolutely great. Soak the cashew nut in some water for some time and grind this to a smooth paste. Cut the paneer into small cubes and shallow fry them in a little till golden brown and keep aside. Cut the onion into chunks and sauté them in little oil. Once it cools grind them along with coriander, chilli, amchur, cumin, turmeric powders, ginger and garlic to a fine smooth paste and keep aside. Grind the tomatoes to a smooth paste into a thick puree and keep aside. Take pepper, mace and nutmeg in a mixie jar and grind it to a fine powder and keep aside. If you don’t have mace and nutmeg then replace all the three ingredients with ½ tsp of garam masala powder. In a pan heat the oil, add the onion paste first and sauté till the flavors emerge from it. Next add the tomato puree and cook till oil comes out of it. Now add the milk , masala powder or the garam masala powder and mix well. Let it come to a boil. Now add the cashew paste, sugar, salt and paneer chunks and cook for 10 minutes. Garnish with fresh coriander leaves. Serve this piping hot with rotis. This tastes even better with parottas. Pour this rich gravy on the parottas and let it soak for 5 minutes. Simply Mmmmmmmmm………..